What is an egg candler? This is a common question we are asked. An egg candler is a device used for testing eggs. Candling eggs is a method of testing eggs while they are incubating to determine if they are viable or not. "Viable" means that the egg is fertilized and an embryo is able to develop and hatch. Today most egg candling is done using a light bulb (either LED or incandescent bulb) to provide a light source and the device channels the light into the egg so you can determine if the egg is developing into a chick. The term "candling eggs" comes from the process used before electric bulbs were used. It was common to use a candle as the light source for testing eggs and put the candle in a box or container of some kind, then cut a hole large enough to put the egg onto but NOT large enough for the egg to fall through. Do this in a dark room and the light from the egg candler will shine through the egg and you can determine if the egg is developing. Today, we don't generally use actual candles for testing eggs, we use simple electric lights that are designed especially for candling eggs. There are two general types of devices commonly used for egg candling. One uses AC power and you plug the cord into a wall outlet and the bulb turns on. Put the egg in the hole where the bulb's light is shining out, turn out the lights, and you'll be able to see what is developing inside. 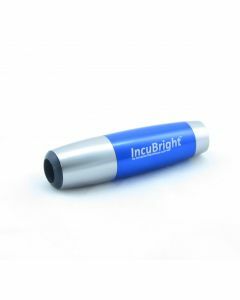 The second style is similar to a flashlight, but uses high-density LED bulbs and the end of the light has been modified to allow the egg to fit tightly onto it so that no light escapes from the seam between the egg and the egg candler. Many customers prefer the LED style egg candler because it does not create enough heat to harm the egg and they don't have to worry about having to plug the egg candler in to the wall outlet for it to work. 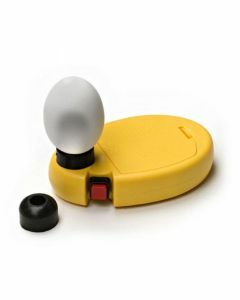 The battery powered LED egg tester can be taken anywhere and tends to be more convenient to use. So, what is an egg candler? Just a simple device to help you see if your eggs are developing or not.